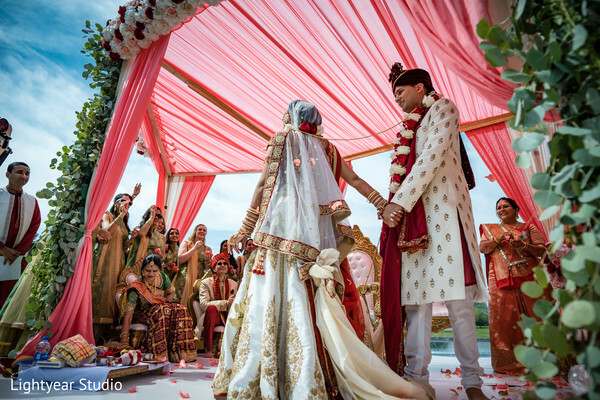 Join me Maharanis into a new wedding journey! 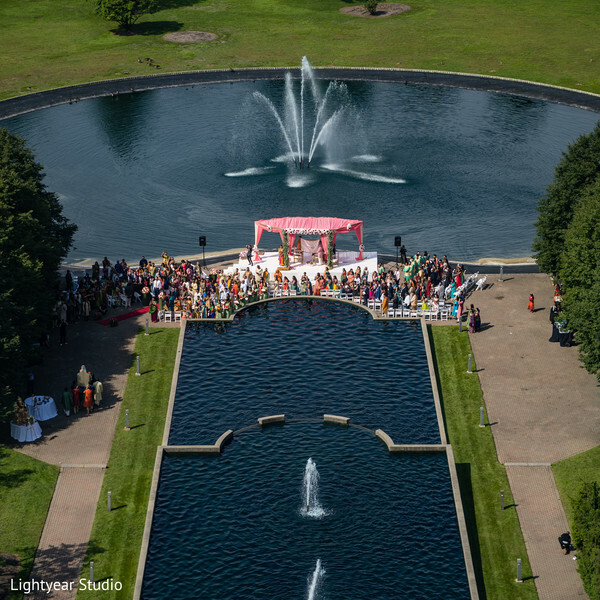 The celebrated Sheraton Mahwah Hotel in New Jersey was the idyllic scenario for the union of Pooja and Yogin! 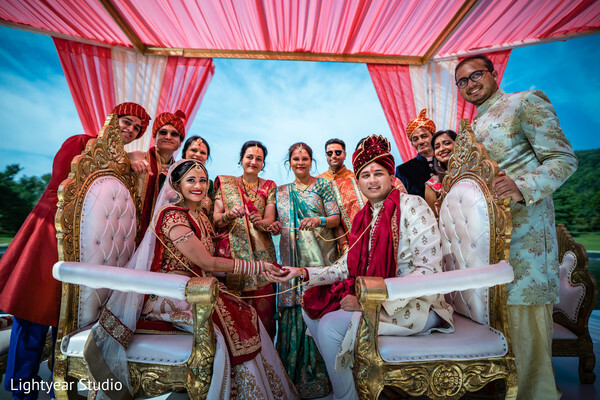 Pearls Event and Co. provided all their expertise with incredible ideas to help this lovely couple to build the wedding of their dreams. The massive fountain of this exclusive hotel served as a backdrop for the outdoor ceremony that came to life thanks to Florista Decor. 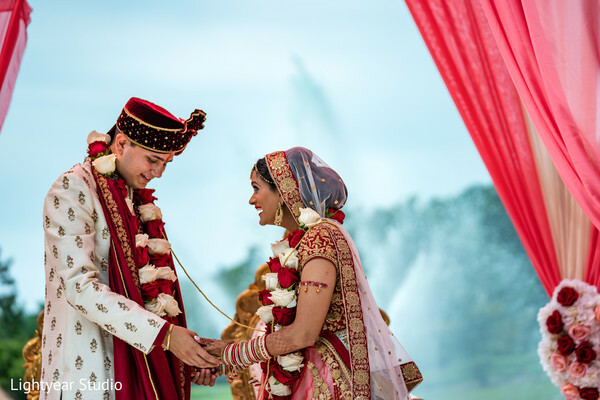 The decor team created an unforgettable experienced for the bride and groom under a fabulous mandap that dripped abundant greenery and a splendid bed of roses at the top! 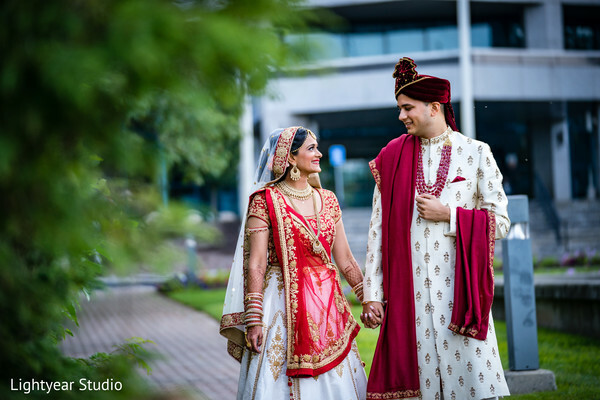 Roma's Henna Design decorated the bride’s arms and hands with a unique mehndi design that completed a three-piece ensemble that consisted of a white lehenga skirt, a red contrasting choli, and a long dupatta! 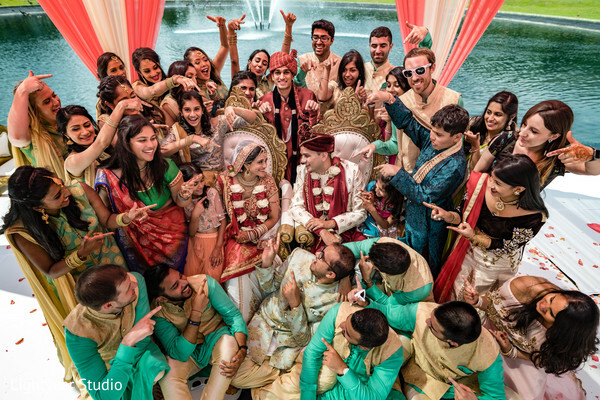 Lightyear Studio captured the excitement of the day perfectly and Joseph Minasi Studios was in charge of the videography! See the incredible images in our full gallery! Yogin and I met around eight years ago, through a mutual friend. We were both students at the George Washington University in Washington, DC. We became the best of friends right away - confiding in each other, making fun of each other, and goofing around together. After about two and a half years of friendship, Yogin hinted at making our friendship into a relationship. I was worried that if it didn't work out, I would lose my best friend. But, I also wanted to know what it would be like to date my best friend. We started dating on August 25, 2013 and got married exactly five years later - on August 25, 2018. I knew that Yogin was the one I wanted to marry when we went on a trip to Maine together. We were hiking around Acadia National Park and we had a moment where we both were looking out at the view and were silent. I looked toward him and thought to myself, I wouldn't want to be here with anyone else. That's when I knew. This is a great story. The weekend that Yogin proposed was incidentally, the same weekend that I was graduating from law school. My best friends from college were visiting to attend my graduation - they arrived Friday early afternoon. We had made a plan to visit Great Falls Park (a national park near Washington, DC where we live) and then go out to dinner in the evening. We are walking around Great Falls Park when I notice an envelope on the side of a trail with my name on it. I was confused, opened the envelope, and realized it was a clue. At that point, my friends told me they would see me later and wished me luck. I walked further on the trail and saw the second envelope. Of course, my nervous self gets confused and I keep walking. About five minutes of walking, I realize there is no third envelope and that I think I'm lost. So, I backtrack and realize I was supposed to make a left at the second clue. I see a tall guy in a blue blazer through the trees and run towards him. Turns out Yogin figured out I would get lost (I'm really bad with directions) and was keeping an eye on me. He gets down on his knee and proposed on the edge of a cliff at Great Falls Park. The most enjoyable part was figuring out ways to incorporate bits of me and Yogin into our wedding. We love the outdoors, hiking, and nature and wanted that to resonate with our guests. 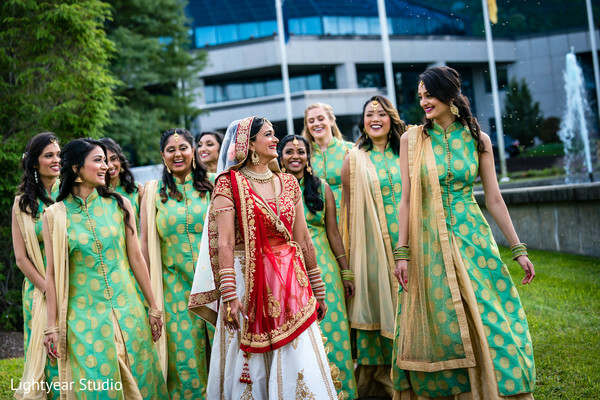 The first step was picking a venue that permitted an outdoor space - the Sheraton was a natural choice because of its beautiful greenery and fountains. The second step was with decorations. 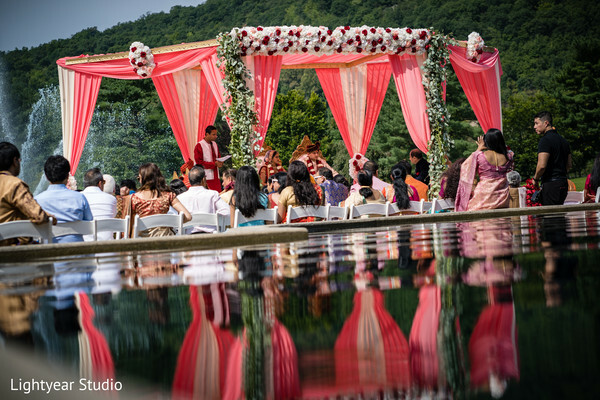 Our mandap was pretty simple because we wanted the view to speak for itself. For our reception, we wanted it to feel like we were in a park - so we incorporated lamps, a bench, and gates. Our centerpieces matched the garden/outdoor theme as well. We also hand-selected much of our music - based on what we liked and the songs that were special to our relationship. Our website is a lot of what both of us like - the songs, the social media, the photos. 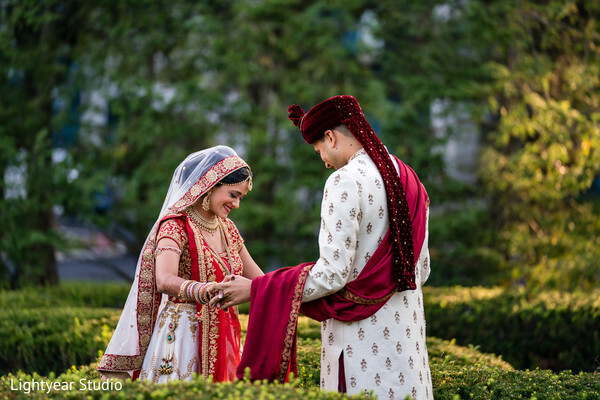 Through this process of working to incorporate our personalities into our wedding, we learned a lot about each other. I learned that Yogin is a groomzilla - just kidding, he's super detail oriented and loves to be helpful. I learned that Yogin doesn't leave things half-finished - he's a total perfectionist. Most of all, I learned that he's a great partner because I never felt like I was planning by myself. We've received many compliments on the venue itself and the food. 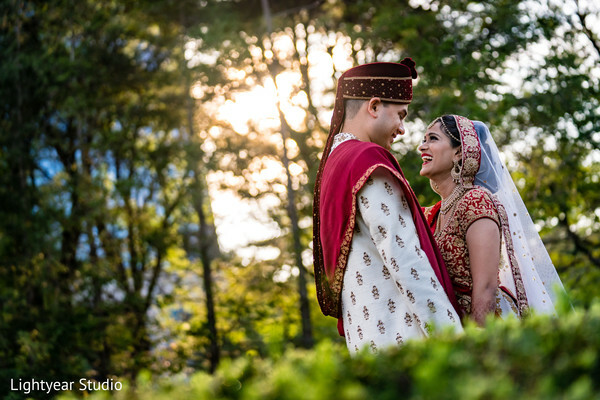 Our wedding was the Sheraton Mahwah and we were lucky enough that the weather cooperated and allowed us to have the ceremony outdoors. The weather was great - it wasn't too hot and there was a nice breeze. Our food was from Moghul - people loved it! During the reception program, there was a moment when our DJ said that we have a very special performance by the groom. I was floored - not only was I not expecting a performance, I never thought Yogin would be the one to give a surprise dance solo. He incorporated all of our favorite songs and danced his heart out for me. It was a flawless performance and it was so clear that he had practiced so much so that it would be perfect. During the ceremony, we ordered these portable fans that with our wedding hashtag on them. Because our ceremony was outdoors, we thought people would appreciate having mini fans that plugged into their phones. Our reception decor was a continuation of the outdoor theme - we incorporated an outdoor garden theme in the evening. We also had a white dance floor and the dancing on clouds effect, which looked beautiful on the white dance floor. Have fun in the process! Being married is incredible but being a bride is the one time that you get to ask for what you want and be treated like a princess by everyone around you :) Wedding planning is stressful but it will all work out in the end and people will appreciate your attention to detail and hard work. It's a marathon, not a sprint - take it one day at a time, one detail at a time. My mehndi was done by Roma Shah (@romashennadesigns) - and it was FLAWLESS. Seriously. Roma incorporated a Dulhan/Dulhani, the Washington DC skyline, the Washington Nationals logo (mine and Yogin's favorite baseball team), and the GW logo (the university we met at) in addition to these beautiful flowers and other designs all over. I was so in love with my mehndi. See how these lovebirds celebrate their love, coming up next. Medley Entertainment, Pearls Event and Co. and Florista Decor are members of the Platinum Guide. Love what you see? Explore their portfolios.